Roberto’s Xocolatl Restaurant is teaming with Acción En La Cruz to present a specially priced dinner to help raise funds for the well-received (formerly Work for Food / Action for Food) La Cruz charity project that has resumed with the recent alliance with Fundación Punta de Mita. Mark your calendars now for this Saturday July 27th at 7:00 PM. A choice of chicken or fish dishes specially prepared by Roberto, Raul and the staff ofXocolatl will be offered for only $150 pesos, of which $50 pesos will go to Acción En La Cruz to purchase the despensas (rice, beans, tomato sauce, noodles, cooking oil, tuna, milk, corn meal) that the volunteers receive in exchange for their community work. 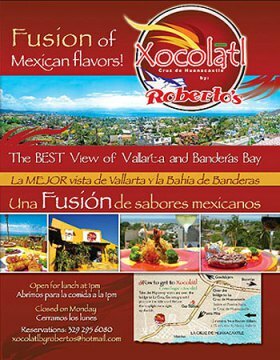 This special evening will be an opportunity to enjoy the wonderful food offered at Roberto’s while taking in what many consider to be the best view of the Bahia de Banderas; past the quaint streets of La Cruz to the Marina Riviera Nayarit, across the bay to Nuevo & Puerto Vallarta with the Sierra Madres as the backdrop all the while mingling and socializing with your new and old friends and neighbors. This is a casual, social gathering and is NOT a dinner meeting. There will be no boring talks or lectures or useless updates. If you have questions, opinions or suggestions about Acción En La Cruz, there will be individuals available to assist. As a special extra, Roberto has offered to allow anyone to “upgrade” their meal; if you have a favorite dish or would like to try something different from the menu, $100 pesos will be applied to that meal. So whether you’re looking for a great deal or just want an excuse to dine with a bunch of friends, please plan on attending this special evening event. In order to help Roberto & Raul prepare, we ask that you RSVP / reply back to this email or phone 322-116-4731 to indicate how many people and your preference of chicken or fish. Roberto’s Xocolatl Restaurant is located in La Cruz de Huanacaxtle on the corner of the main Punta de Mita Hwy and Calle Monte Calvario, a short block before the (only) stoplight as you head towards Punta de Mita. Click here for GOOGLE MAP.